Down to the final day of Last 16 today, all the QF line-up will be revealed very soon. Mark Allen sets up a rival with Stuart Bingham in the quarter-finals. 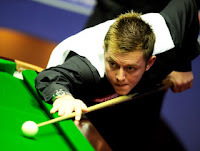 Allen won over Marcus Campbell, who defeated Ali Carter in the previous round by 5-1. Allen had a fine performance today. He presented two centuries 101 and 100, 71, 67, 63 today. Allen: "He (Bingham) said about getting revenge on Ding for his Crucible defeat but it would be nice to send him back where he belongs. "He doesn't like me because I told the truth in a press conference that he has no bottle and as he threw away a match at the World Championships after leading 12-9 I think that showed it. "It was great he did because that let the legend that is Stephen Hendry stay in the top 16 and I would rather see Hendry in the top 16 than Bingham." Bingham: "I can't wait to play this match," "He (Allen) said a few words after the UK Championship which were a bit out of order and I've been waiting for this match for a while. "He said I've got no bottle and he thought he was never going to lose to me. I will definitely be up for it. "I don't know what happened. With the game at the UK I was gutted I lost as I would've got into the semi-finals. I remember I shook his hand and didn't say anything. He took that to heart. "But I don't care what he thinks. We're here to do a job and hopefully I will win. It will give me more pleasure to beat him. "It's all mind games and I'm a better player now than I was." Their quarter-finals match tomorrow will be an awesome one. I am interested if they will shake hands before and after match! Will post the post-match quote tomorrow! 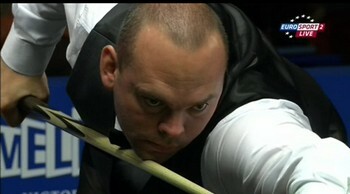 Mark Williams beaten David Gilbert by 5-2 with a much improved form today. His opponent in the quarter-finals will be either Neil Robertson or Dominic Dale. "I would probably prefer to play Neil as there would be a big crowd. All of the support would be on his side and I can handle that. It would be a good occasion to play in front of his home crowd. However Williams's preference on Robertson to be his next round opponent could not turn into face. Neil Robertson suffered a dramatic defeat 4-5 by Dale, despite trailing 2-4 to a decider and passed the winning line in the decider. Dale needed one snooker to win the match after Robertson left him pink and black. Dale got the snooker he needed, potted the final pink and black to win the decider by 70-69. The local crowds are disappointed with the result. Ireland's Ken Doherty bounced back from 1-4 down to win 5-4 against Liang Wenbo to move into quarter-finals in 2 years' time since 2009 Shanghai Masters. "I just dragged myself back into the game and hung in there. It's a great comeback.'' Doherty said. "I never throw in the towel but when things are going your way you can't see a way out. Ken also apologized for the controversial complaint of Liang's bow-tie issue on World Cup last week in Thailand. "The next day I felt bad saying about his dicky-bow," "I hope it didn't cause any offence, if it did then I'm sorry. Ken Doherty faces Mark Selby in the quarter-finals who defeated Mark Davis by 5-3 today. Selby beleived that his winning of Wuxi Classic can boost his confidence.